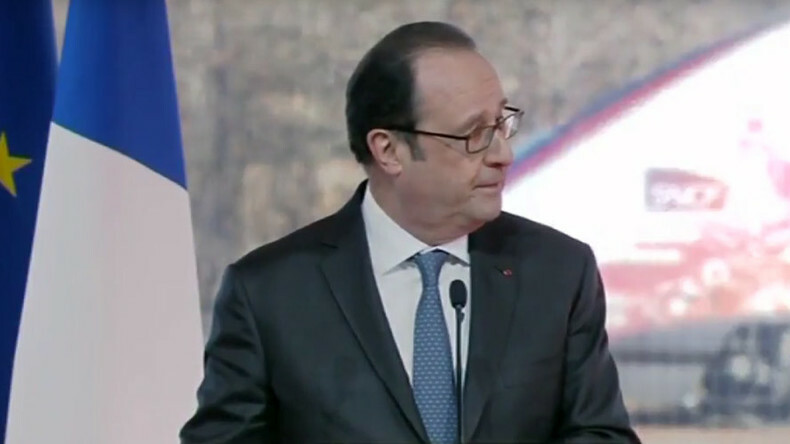 Two people were injured after a police sharpshooter accidentally fired his weapon during a speech given by French President Francois Hollande, according to a French official cited by the AP. Hollande was speaking in Villognon, Charente in western France at the opening of a high-speed train between Paris and Bordeaux when the sound of a gunshot interrupted his speech on Tuesday afternoon. A shot is clearly heard ringing out in footage from the scene. "I hope that wasn't serious," Hollande said nonchalantly before continuing with his speech at the unveiling of the LGV high speed rail line. It’s understood the weapon’s safety mechanism was not on when a sniper, located on a nearby rooftop, tripped when changing position and accidentally fired his weapon in the process, reports Le Parisien. The bullet landed in the marquee in which Hollande was addressing the assembled crowd, according to Soud Ouest. Two people located inside the marquee received leg injuries as a result, although they’re not believed to be serious. One is understood to have been a waiter and the other a member of the LGV maintenance crew, according to L’Express. Following his speech, which lasted around 20 minutes, Hollande is reported to have met with the injured parties, both of whom were treated on site. An investigation into the incident has been launched and a public prosecutor is expected to hold a press conference later on Tuesday, reports La Provence.